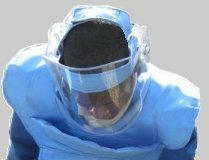 The SD Falcon demining body-armour is a simple and lightweight armour that was originally designed at the request of a customer and is now offered as part of our range. 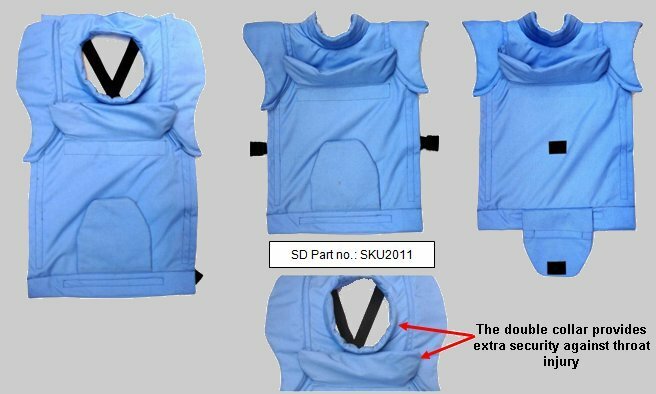 A variation of the SDV and Raptor aprons, this simple design has an open back and a flap to extend protection over the deminer’s groin and frontal thighs. The flap can be raised when walking around. Protection is concentrated over the upper body and vital areas with a design that includes a double collar, one inside and one outside the visor. Shoulder-pieces allow full arm movement while protecting the vulnerable underarm areas. The overall design makes it easy to work and walk in. A generously sized outer collar ensures overlap with the SD visor range. The Falcon's open back and simple cross-over and waist straps make it comfortable and relatively cool. With a multi-layer polyamide inner covered by a washable outer designed to be exceptionally long-lasting and resistant to abrasions, tears and scuffs, it weighs ?? ?kg and offers protection above the IMAS 10.30 requirement of NATO STANAG 2920 450 m/s.